The archbishop of Seoul and apostolic administrator of Pyongyang celebrated a Mass for Reconciliation, praying for a successful outcome of the inter-Korean summit tomorrow. The commitment of the Korean Church and of Pope Francis. The protection of the Immaculate, Patron of the diocese. Seoul (AsiaNews) – In anticipation of the inter-Korean Summit, which will see the historic meeting between Kim Jong-un and Moon Jae-in, Card. Andrea Yeom, Archbishop of Seoul and Apostolic Administrator of Pyongyang stresses the tenacity of Christians in wanting the unity of the Korean people and the reconciliation of the peninsula. It is an example, in addition to the charitable work of the Southern Church towards the people of the North, the commitment to prayer, with a Mass of Reconciliation that for 23 years is celebrated every week in the Cathedral of the Immaculate in Seoul. Two days ago, Card. Yeom presided over the 1163th celebration, in the presence of Msgr. Marco Sprizzi, in charge d’affairs of the nunciature, the 3 auxiliary bishops, Msgr. Benedetto Son, Timoteo Yu, and Job Koo, and Fr. 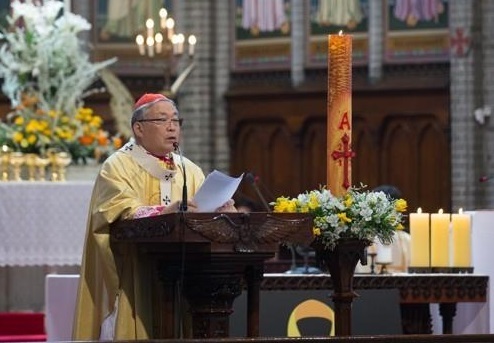 Achille Chung, head of the National Reconciliation Committee of the archdiocese. Here we publish the full text of the cardinal's homily. This evening we are celebrating the Holy Mass for the reconciliation of our people divided between the South and the North. The faithful of our Diocese have never failed to gather together at this Cathedral of Myeong-dong to celebrate this Holy Mass regularly at 7 o’clock every Tuesday evening over the past 23 years. Especially in recent years we used to celebrate this Holy Mass also with the additional intention to keep in our heart and pray for those 57 parishes which had been active in the North before the country was divided. Yes, indeed, my dear Brothers and Sisters, the purpose to celebrate the Holy Mass for the national reconciliation is thus none other than to accomplish with ardent zeal the mission we have inherited from the Lord as His faithful disciples to work hard so that each and every one of our people in the Korean Peninsula might “have life and have it abundantly”. In observing the wind of peace blowing recently upon the Korean Peninsula, I, Archbishop of Seoul and Apostolic Administrator of Pyong-yang, cannot but express deep gratitude to God for such Providence that has made it possible, while reflecting upon the fact that God always remembers the fervent petitions we have offered Him though the Holy Masses, Rosaries and other prayers. These were indeed prophetic words which still resound in my heart. I heartily thank our Holy Father. Now, the forthcoming South-North summit to be held in three days must be a historic opportunity on which the fate of our nation is at stake. The Authorities should focus on nothing else than coming to an agreement to promote together the common good of our people and on putting it into practice, disregarding their own political and party interests. They should above all bear in mind that peace, so desired by the entire people, “is not merely the absence of war; nor can it be reduced solely to the maintenance of a balance of power between enemies.” (Gaudium et Spes, 78) Therefore, peace in the Korean Peninsula cannot be maintained by the nuclear armament at all. It can only be realized by assuring that all people live a life truly worthy of a human being, trusting one another, on the basis of love and justice. Through this South-North summit, to be held as the third of its kind since the nation was divided 73 years ago, directly responsible Authorities must act with wisdom and discernment to plant the roots of true peace deeply in the Korean Peninsula. This amounts to building relationships of trust for our nation within the international community. (Cf. Pope Francis, Urbi et Orbi Message, Easter, 1 April 2018) and promoting the peace in Asia and in the world. Undoubtedly we do not expect that this will be realized in a day. It is necessary to keep the dialogue going with patience. I sincerely thank all those authorities who have made painstaking efforts to realize this historic meeting and dialogue of the top leaders of the South and the North. In addition, I wish that God may bless and guide all those who will be engaged in eliminating nuclear weapons and establishing true peace in this land, thereby promoting the peace in the world. Peace is above anything else a gift of God. Let us assure our Lord that we first will be “the peacemakers”(Matt 5:9) and together implore God through this Holy Mass so that this South-North summit may bring forth real and permanent fruits for true peace and authentic development of our people. And let us entrust such desire we have long cherished in our hearts to Holy Mary Immaculate, Patron of our Diocese, Mother of God, Mother of the Church, our benevolent Mother who loves our people. O Glorious and Blessed Virgin.